Regarding the distribution of patients by age groups, the largest number of cases this week have been reported in the age group of 15-64 years and the highest incidence is registered in the age group, children from 5-14 years. 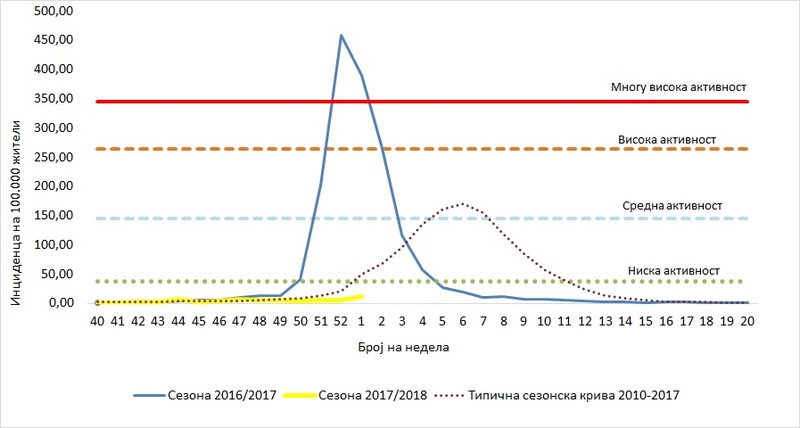 This week the biggest number of influenza cases is registered in Gostivar, n= 61 and also, the highest incidence is registered in Gostivar (I = 50.9/ 100.000). In 13 reporting units was registered a very low activity of the influenza virus, and Debar and Gostivar registered seasonal activity . 16 units didn’t registered any. In the 2017/2018 season, the total number of influenza like illness (ILI) cases is 1328 (I = 64.2 / 100.000). During this week the laboratory for virology of IPH has received 9 samples, materials for laboratory diagnostics. Three samples are positive for the presence of influenza virus, subtyped as one is А(H1N1)pdm –and 2 Influenza A non-subtyped. Since the beginning of the season 2017/2018, the laboratory received 82 materials, of which, 6 are positive (7.3%) for the presence of the influenza virus., Four are Influenza A(H1N1)pdm , subtyped as one is А(H1N1)pdm –and 2 Influenza A non-subtyped, and two are Influenza B (Yamagata). Vaccination with the seasonal flu vaccine started from October 17, 2017. The total number of 3-type vaccines (Influvac, produced in Abbot Biologicals Olst, Netherlands) for this season is 27997 doses. According to reports received by CPH / RO, 27997 people were vaccinated, or 100% of total purchased vaccines. The majority of the vaccinated are aged over 65 years – 60.5%, From the total number of the vaccinated 75.2% have a history of chronic diseases. According to records presented in Flu News Europe, the activity of influenza virus in Europe is low, The situation is common for this time of year. The influenza virus activity is increasing in the countries of the western, northern and southern part of the continent,. In terms of geographical distribution, 14 countries are sporadic, 1 local, 7 regional and 9 widespread. 44% samples were confirmed as positive. So far, influenza type A is predominant with 37.5%, and most of the viruses are subtyped as А (H1N1)pdm09 with 60.7% and influenza type B with 62.5% (96% – B/Yamagata).